Dogs are the animals that humans have lived with and bred for the longest time. Today, there are around 400 different dog breeds. Dogs are known to be the very first domestic animal of mankind and were historically used as hunting or pet dogs. They have accompanied humans for thousands of years, and over the time fulfilled various tasks in many aspects of man’s life, from hunting and herding in the old days to assisting police or disabled people in modern times. Dogs are remarkable animals because of their sensitivity about the people they live with. Since they started participating in human cultures almost everywhere in the world, they learned how to adapt to the needs of their owners. The impact left by dogs’ participation in human activities has given them the nickname “man's best friend”. The most ancient proof of dogs being bred by humans was found in Persia and dates back to 9500 BC. In Ancient Egypt, dogs served as watchdogs guarding over homes or women’s quarters. In the Roman Empire dogs were even used in the military. And according to European folklore belief, dogs were able to prevent and inform about the presence of ghosts and evil spirits. From hunting and herding dog to trusted companion… over the time dogs have assisted humans in various ways, and there are many tales about their fidelity towards humans. Nowadays, dogs are regarded as important and valued family members. Dogs can be of great help in the development of children both physically and emotionally. Not only do young infants who grow up surrounded by more than two animals show an increased resistance to allergy-inducing substances, but recent research shows that dogs also provide emotional stability and support the psychological development of children. Moreover by caring for their pet dog, such as giving it food, hugging and talking with it, children can make valuable experiences which foster their sense of responsibility, compassion and consideration of other beings. In 2014 as many as 81 000 puppies were abandoned in the streets in South-Korea. These puppies who have been forced to exile in the street cannot feed themselves sufficiently and the longer they are exposed to the exterior environment, the more their health degenerates and they eventually suffer from various diseases. If such animals are not reclaimed by their owner in time, they face a lonely and sad destiny. These dogs were once loved and adored by humans… as valuable members of our family they should never be thrown away like an object that is no longer used. A portion of the profits made with the sales of BONTOY-Traveller will be donated to several organizations and associations engaged in the protection and rescue of abandoned animals. 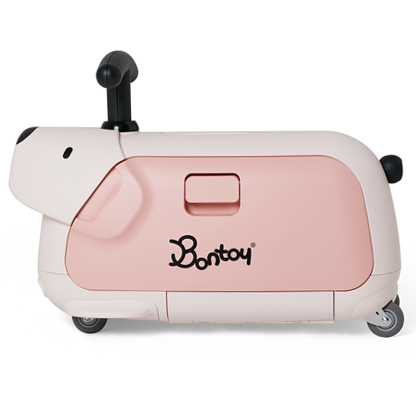 The second character of BONTOY is the “PUPPY”. Puppies are lovely and reliable friends who always stay by our side. Children living with a dog from an early age are more likely to develop an emotional sense of security. Moreover, taking care of a puppy teaches kids how to be considerate towards other people and living beings. We at BONTOY always care about children’s health and happiness. Ride-on toys support the development of gross motor and cognitive skills. Get hot and sweaty while whizzing around on Bontoy Traveller. Scared of grown-ups telling you to play quietly? Don’t worry! Bontoy Traveller wheels have brought “noiselessness” to perfection. My favorite doll, my candy, the picture book I read before sleeping: everything goes neatly inside. 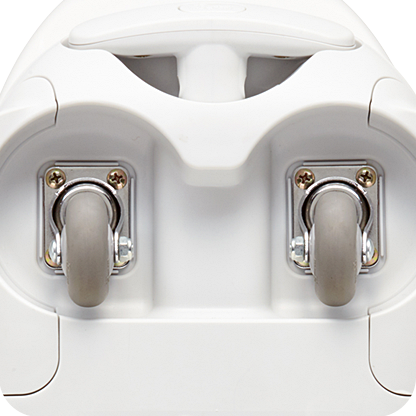 The 17-liter storage is perfect for children who can’t let go of their favorite possessions. 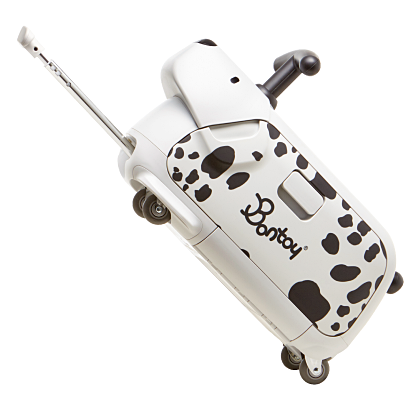 Be it a weekend at your grandma’s house or a short trip abroad: no need to leave Bontoy behind. 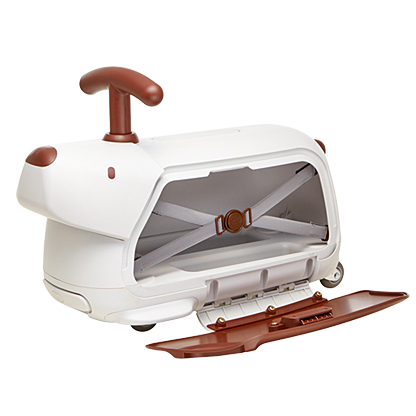 Extend the carrier handle and take Bontoy Traveller with you where ever you go. Suitable size for trunk and carry-on luggage. 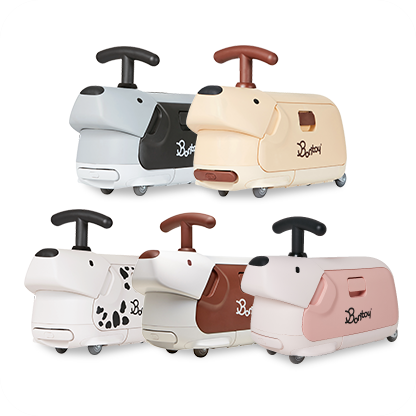 A cute puppy design that will put a smile on any child’s face. All contents copyright (C)2014 EFOLIUM. All rights reserved.